If you want to become a good golfer it is imperative to have a good swing. A good swing is one you can rely on to hit the ball straight. With a driver in your hand, you expect to hit the fairway. With an iron in your hand from, say, 150 yards out, you expect to hit the green. Maybe from 160. What happens if you don’t have a good swing is that you don’t get the ball on the green or close to it in the regulation number of strokes. It’s likely that your next shot is from too far away to get the ball close enough to the hole for one putt. It could be that just getting the ball on the green is an issue. The solution is not to learn how to hit those demanding short shots better. The solution is to get a better swing so you don’t have to hit them so often. Now the golf swing is a very complicated act, and there’s a lot of instruction out there in print and video meant to guide you around the curves. Lessons? By all means take lessons. Most lessons, though, are meant to patch up your swing. To get a better swing you really have to start over and build it from the ground up. That’s a huge commitment most recreational golfers do not have the time to make. What to do? It’s me to the rescue. My latest publication, Six Fundamentals of the Recreational Golf Swing, identifies six key features of the golf swing that lead to straight shots, in the air, time after time. That good swing I defined earlier? Here’s how to get it. I took long-standing swing principles, added a few twists of my own, and came up with an organized way to get the clubhead to the ball with a square clubface and traveling toward the target. And if that doesn’t happen (nobody’s perfect), you’ll know why and you can correct yourself before the next swing. Six Fundamentals is FREE, and there’s nothing like it anywhere. I’ll let you know in next Monday’s post how to get your copy. Everybody tells you the best way for an amateur to shoot lower scores is to have a good short game. That is one way to shoot lower scores, but not the best way. The best way is to have a good swing. The saying should be, according to Boomer, “A good golfer is a match for anyone,” but it all starts with getting the ball on the green as quickly as possible. That means you have to have a swing that can do the job. I have a collection of golf shows from the 1950s and early 60s–All-Star Golf, Challenge Golf and so on. When you watch every shot you really see how the pros make their scores, and it’s by hitting fairways and hitting greens. I’m not playing down the importance of the short game or putting. Once you’ve gotten the ball up to the green, you need to close out the hole as soon as you can. But if you’re getting the ball up to the the green or on it in regulation every hole, you can be mediocre around the green and still shoot a good score. Otherwise, your greens game is all about preserving bogeys and maybe even doubles, not about shooting a low score. Maybe 90 is a low score for you right now. What I mean by a low score, for a recreational golfer, is 78. A 90-shooter has twelve strokes to lose, and you won’t lose them by becoming a wizard around the green. You’ll lose them most of all by improving your swing and then by learning to hit the ball with that swing more often. 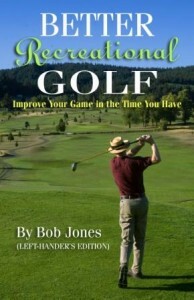 In two weeks I will release my latest publication, Six Fundamentals of the Recreational Golf Swing. These fundamentals are the distillation of my work over the last three years to identify explicitly what I do when I hit the ball well. If you install these fundamentals into your swing, you WILL hit the ball better and shoot lower scores. This publication is FREE. I will give you details on how to get a copy in subsequent posts. Should your head move in the golf swing or not? Depends on who you listen to. Many commentators say it has to move, just don’t move it to certain places. Others say with almost religious fervor, Don’t move it! I think all this talk is about not moving is about the wrong thing. It is the suspension point that does not move. Reach behind your head and feel at the base of your neck. There is a hard lump there, a big one. That is a vertebra, the last one in the cervical (neck) spine. That is the suspension point. That is what does not move. While he says it should not move, he allows that it is difficult to keep it still and thus it may shift minimally. However, a few years ago at the LPGA’s Safeway Classic in Portland, Oregon, I made it a point to watch the players from behind, that is with their back facing me, to see what this point did when they swung. Much more often than not, it did not move at all. Not the tiniest bit sideways, up, or down. Runyan goes on to say how pre-setting the position of the suspension point helps you hit different short game shots. I’ll let you get a copy of his book to find out what he says. About the full swing, he doesn’t say much. But I think this is something you might experiment with, not to make that spot rigidly still, but to use it as the pivot point for your swing. More like, it can move, but you choose for it not to. I like to check it every now and then to make sure I’m not getting too carried away and letting my body go all over the place. Concentration is key to playing your best golf. To play your best golf all the time, you have to be concentrating all the time. We can break the cycle of shotmaking, which I call the Golfing Cycle, into six parts, each with its own demand on your concentration. Gathering. This is the stage when you stand beside your ball and look at the course ahead of you. You see the possible shots and assess the variables (lie, wind, hazards, etc.). To gather effectively, you must not analyze logically, but calm your mind and let impressions come to you. Deciding. After you have taken in all the information the course is presenting you, allow the shot to be decided in a process I liken to a wordless knowing. The right shot just makes itself apparent to you on an unspoken level. Do not go through a rational decision-making process. Preparing. You step up to the ball, take a rehearsal swing, get into your setup, all with nothing more than the feeling of the shot in mind. Hitting. The movement of taking the club away from the ball can cause your concentration to break. This is where mental strength is most important. Continue to have that feeling of your selected shot in mind. It will guide your swing so that your body will hit that shot as well as you are able to. Watching. Once the ball has been struck, watch it until it comes to rest or is no longer visible. Do not comment to yourself on how the shot came off, especially if it was a poor one. Critical self-talk erodes your confidence. Besides, too many times I have thought I would be in trouble, but when I got to my ball it turned out to be a lot better than it seemed earlier. Walking. When you start walking toward the ball you have just hit, that shot is over. Forget about it. Immediately put your mind on the next shot. Even though you don’t know what shot that will be, get yourself in a positive frame of mind, right now, about how well you will be hitting it. When you get to the ball, it’s back to Gathering. 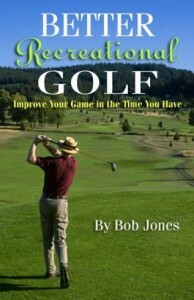 I know golf is a social game, and you want to spend time talking with your playing companions. That doesn’t mean you have to take yourself out of the frame of mind that lets you play your best. Going through this six-part cycle as you make your way around the course helps keep your concentration at a peak for the entire round. 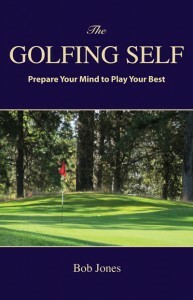 This cycle, and the concentration you need to apply it, are developed fully in my latest book, The Golfing Self. If you can learn to play this way, golf will seem like a different game. Lately I’ve been reworking how I practice golf — what to do with a bucket of balls at the range. For years I’ve been getting it all wrong. I’ve started to do it the right way, but it’s really hard. Let me explain. After I started swinging a golf club again, nine months after my back surgeries, I knew I had to find a swing that put as little stress on my back as possible. I also knew that it had to be a simple swing, easy to remember, because I couldn’t hit balls three or four times a week to keep the swing in tune. After a year and a half of experimentation, I found a swing based on six fundamental principles that worked, was easy on my back, and was easy to re-create after a layoff. The plan now is to apply those principles every time, or as nearly as a person can to that. That takes practice, but the right kind of practice. I now start out at the range reviewing the six principles, focusing on each one through practice swings only. I don’t move on to the next principle until I’m satisfied the one I’m working on is correct. After I have worked through all the principles, and they have melded into one unified swing feeling, I can hit a golf ball. A golf ball. One. It might take thirty swings to get things where I like them before I hit that first golf ball, but I hit it without thinking of swing mechanics, without wondering how the shot will work out. I just swing with the swing feeling I have created for myself and I get a really good shot out of it. Then I start over. I do the same thing again. It might not take me thirty swings until I’m ready this time, but there will still be a lot of them. And then I hit another golf ball. One. And I go through the whole thing again to get ready to hit a third golf ball. Et cetera. I’m getting two things done here. One is lots of isolated practice with each of the six principles so I learn them well. The other is putting my mind in a place where those things I mentioned, worry, swing thoughts, never come into my mind. I just swing with my best swing and the ball goes on its way. That’s how you have to play golf. That’s why if you flub a shot on the course, drop another ball and try again, that second shot is always better than the first — because you don’t have those swing-wrecking thoughts any more. You just hit the ball. So you could say that I’m teaching myself to hit my second shot first. The title of this post is Practicing Golf the Hard Way. That’s because it takes a LOT of will power to take all those practice swings between the time you hit golf balls. But that’s the only I way I know to get it right. Note: I’m writing up the six principles in a small pamphlet to be published in October with related YouTube videos. I’ll keep you posted.